An epithetical question: Should ALL of Rudolph "the red-nosed reindeer" be capitalized? Why or why not, and where do we draw the line? This was inspired by some seasonal discussion on this question on ELL that led me to question my assumptions. Clearly, as the title of a work it should be capitalized. My question is whether we should capitalize the whole thing when speaking about Rudolph. Is his name Rudolph the Red-Nosed Reindeer (a la Eric the Red, Gandalf the Gray, Jabba the Hutt) or is it simply a descriptor? ...but I suspect that whether those last two lines are a quotation from the reindeer or an assertion by the narrator could be debated (based on presence or absence of enclosing quotation marks in different versions). This same intuition about uniqueness tells me that Frosty is "just a snowman" since there are lots of snowmen, but I'm not appositive. There are actually two questions to resolve here: (1) What is the appropriate capitalization of the name/phrase "Rudolph the Red-nosed Reindeer" in the body of the poem or song of that name? (2) What is the most sensible way to refer in a one-off written allusion to the character Rudolph who is a red-nosed reindeer? Should 'the red-nosed reindeer' be initial-capped within the poem? If Rudolph's surname were "Reindeer" and his full name were "Rudolph the Red-nosed Reindeer"—similarly to "Anne Elk" or "Bullwinkle J. Moose," you would certainly expect all of the major words in his name to be initial-capped, regardless of where the name appeared. Tom, Tom, the piper's son, / Stole a pig, and away did run; / The pig was eat / And Tom was beat, / And Tom went crying / Down the street. Whether the little thief's proper name was Tom Piperson or something else, he was identified within the nursery rhyme as "Tom, Tom the piper's son"—a description that falls short of being a cognomen, but instead rates as a given name plus a simple descriptive phrase. Consequently, Wikipedia very properly (in my opinion) lowercased "the piper's son" in the first line of the ditty. 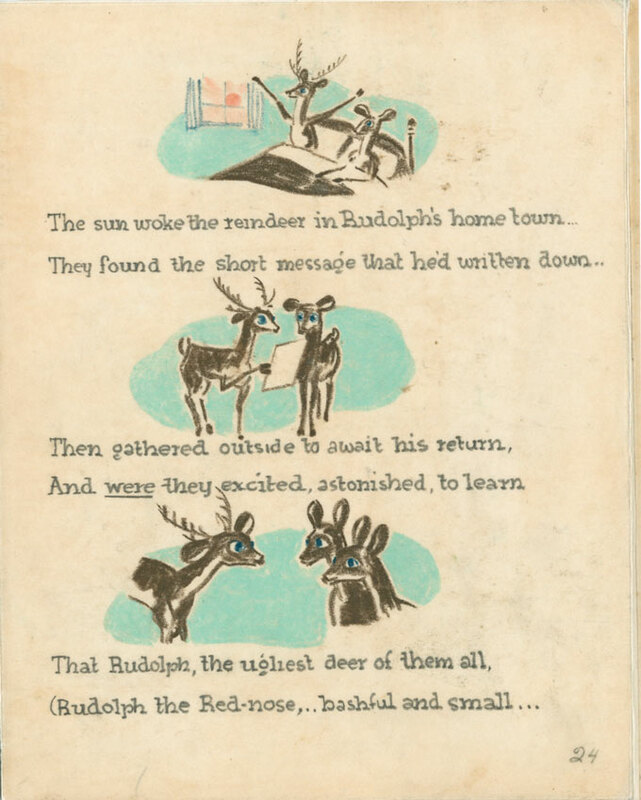 I don't know whether Robert May, who wrote the original book Rudolph the Red-nosed Reindeer in 1939, used the initial-cap form "Rudolph the Red-Nosed Reindeer" in the lines of his poem, or whether that change occurred in the libretto of the song "Rudolph, the Red-nosed Reindeer" by Johnny Marks in 1949, or whether it originated in the idiosyncratic orthographic choices of later third parties. But it would certainly have posed no challenge to story coherence or character recognition within the book if May had lowercased "the red-nosed reindeer" throughout. Should 'the red-nosed reindeer' be initial-capped in incidental allusions to Rudolph? It seems worth mentioning that all of the other reindeer in the story and song are identified by single names: it's Dasher, Dancer, Prancer, Vixen, etc., not Dasher the Reckless Reindeer, Dancer the Rhumba Reindeer, Prancer the Frolicsome Reindeer, and Vixen the Reindeer Fatale. So within the original book, it seems likely that Rudolph's entire name was Rudolph and that "the red-nosed reindeer" was a descriptive phrase, not part of a formal cognomen along the lines of "Eric the Red" or "Norbert the Nose." In the real world outside Robert May's original book and Johnny Marks's original song, however, we run into the problem that there are a lot of Rudolphs (and Rudolfs) and very few widely recognized reindeer with given names—Rudolph the Silent Heartthrob, for example, and Rudolf the Flying Russian, and of course Rudolph Bald-Faced Lawyer. As a result, there are relatively few occasions on which the point of identifying Rudolph as "the red-nosed reindeer" is to distinguish him from other reindeer that might otherwise come to mind. Instead, the full expression usually arises in the context of instances where people want to refer to the now-familiar character Rudolph (who happens to be a reindeer with a red nose) in a way that immediately distinguishes him from other prominent Rudolphs. If one were to file a police report about a red nosed reindeer named Rudolph who strolled by one day and stole 2 apples, the police would be at least some steps farther from apprehending the suspect than if the complaint were filed against Rudolph the Red-Nosed Reindeer, who is clearly famous. He will go down in history. This is a good question. I am sure Rudolph the Red-Nosed Reindeer is correct. It is the name by which he is known. I'll agree. It hardly matters whether that sentence is in the voice of the narrator or the herd of reindeer. What matters is that the entire phrase in question is used as a direct address. In that context we must treat the whole thing as a unit and as a proper name. I won't agree that the uniqueness of the appositive makes any difference. I suspect that Erik the Red wasn't the only redheaded Norseman (or even the only redheaded Norseman named Erik) in his day. All that matters is whether we'd treat the entire phrasing as a name. Hey Frosty the Snowman, stop trying to upstage Santa. Your big scene comes later. When it is natural to treat the whole phrase as a direct address, it's reasonable to treat that whole phrase as a proper name. Not the answer you're looking for? Browse other questions tagged capitalization appositives epithets or ask your own question. “the” is in my business name, capitalize it or not? Does the orthography of a book title matter?